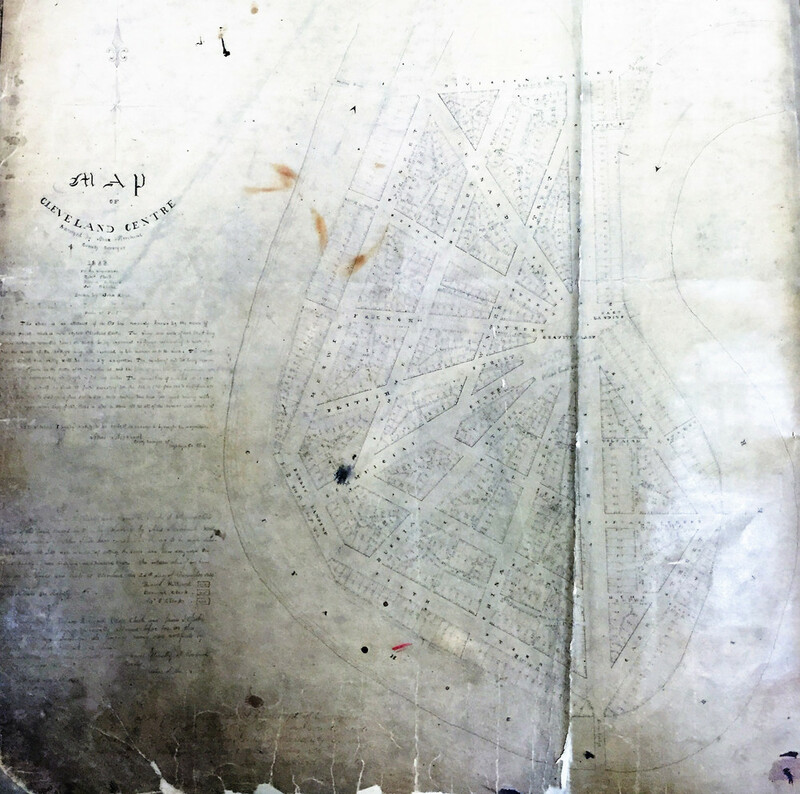 This 1833 development proposal in the Flats featured streets named after foreign countries, all radiating from a hub called Gravity Place, to signify that this place was destined to one day become the center of Cleveland business and trade. Historian Samuel Peter Orth, looking back at the idea in 1910, called it "pretentious." 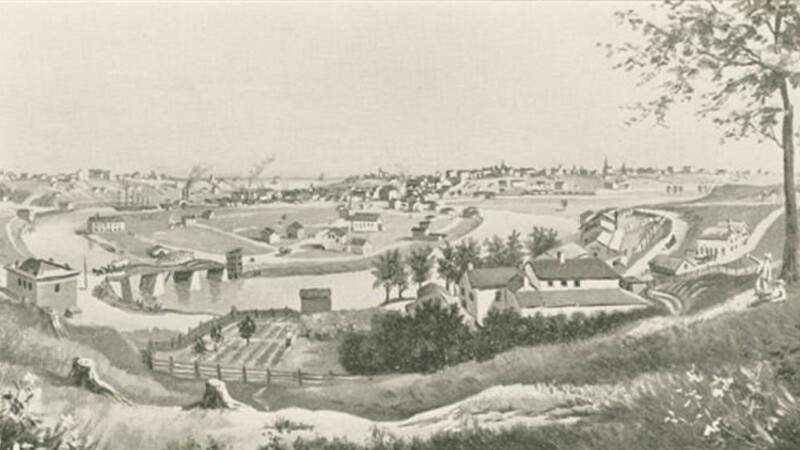 As the Ohio-Erie Canal, built between 1828 and 1832, was nearing completion, many in Cleveland caught "canal fever" and began to believe that their town was so strategically situated on the Great Lakes and along the new canal that it was destined to become an important world trade center. 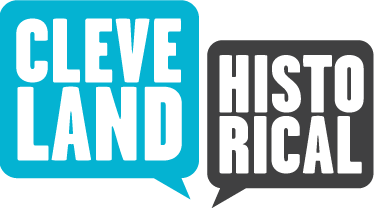 One man who invested in that belief was James S. Clarke, the former Sheriff of Cuyahoga County and, in the decade of the 1830s, one of the biggest real estate speculators in Cleveland. In 1831, Clarke, Richard Hilliard (a wealthy dry goods merchant), and Edmund Clark (an insurance agent and banker) formed a partnership and purchased fifty acres of land just south of the Village of Cleveland in Cleveland Township. The acreage constituted the southern part of a peninsula surrounded on three sides by the Cuyahoga River and located just south of the river's first bend. 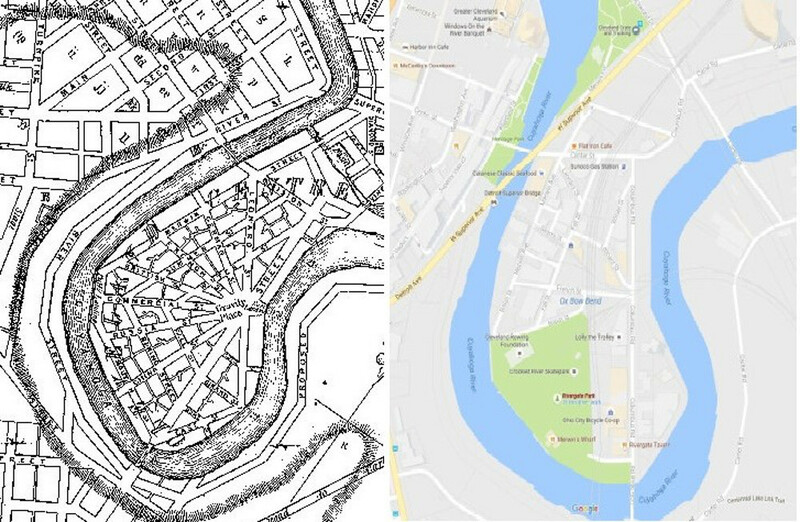 On this land, then known as Case's Point (but which today is a part of the Flats we know as Ox Bow Bend or Columbus Road Peninsula), the partnership platted a development in 1833 called "Cleveland Centre," which featured streets named after foreign countries—British, French, German, China and Russia—radiating from a hub called Gravity Place, an appropriate name, they thought, for a future center of world trade and business. 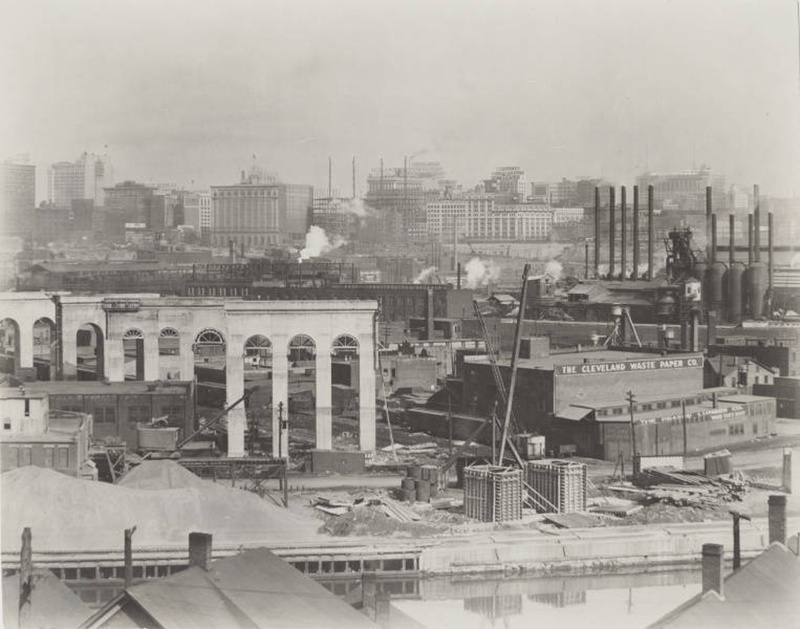 The land was ideally situated just south of the new Canal Basin, where Great Lakes ships traveling up the Cuyahoga River were expected to anchor and receive or transfer cargo to or from awaiting canal boats. Lots in the new development sold well in the early years and soon a small village sprouted at Cleveland Centre. 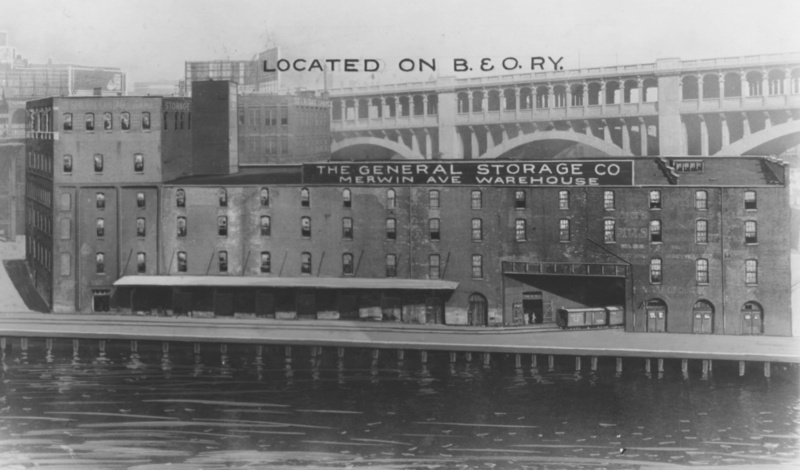 Commission merchant offices, warehouses and docks were built on the western side of the development, primarily on Merwin Street, where a young John D. Rockefeller got his first job as an accounting clerk years later. On the east side of the development, a residential neighborhood formed around Columbus Street (today, Columbus Road), the main avenue running north-south through the Centre. It wasn't long before there were so many Irish and German working-class immigrants living there that, in 1838, they built the first Roman Catholic church in Cleveland, St. Mary's on the Flats. Cleveland Centre also received a boost in the 1830s by Clarke's construction of the Columbus Street Bridge in 1835—the first permanent bridge across the Cuyahoga River at Cleveland—and in 1836 by the platting of Willeyville. 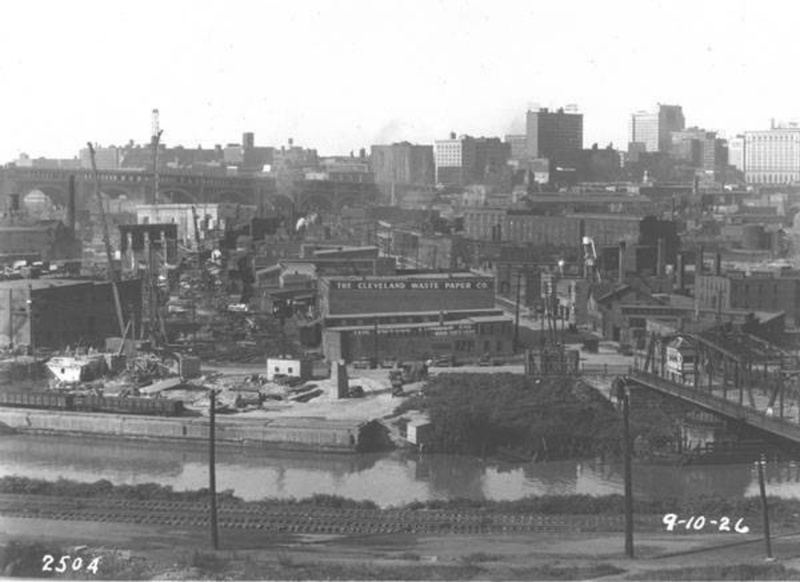 Another development by Clarke and others, Willeyville was located on land directly across the river from Cleveland Centre and connected to it by the Columbus Street Bridge. 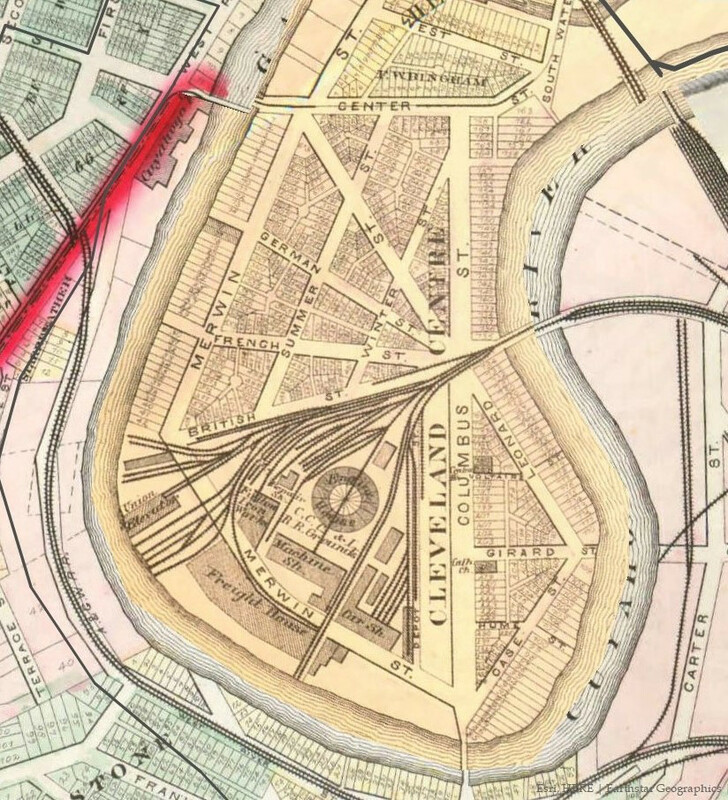 Despite James S. Clarke's optimism and promotion, and the promising beginning in the decade of the 1830s, Cleveland Centre, which was annexed to Cleveland in 1835, did not become a center of international trade and business. 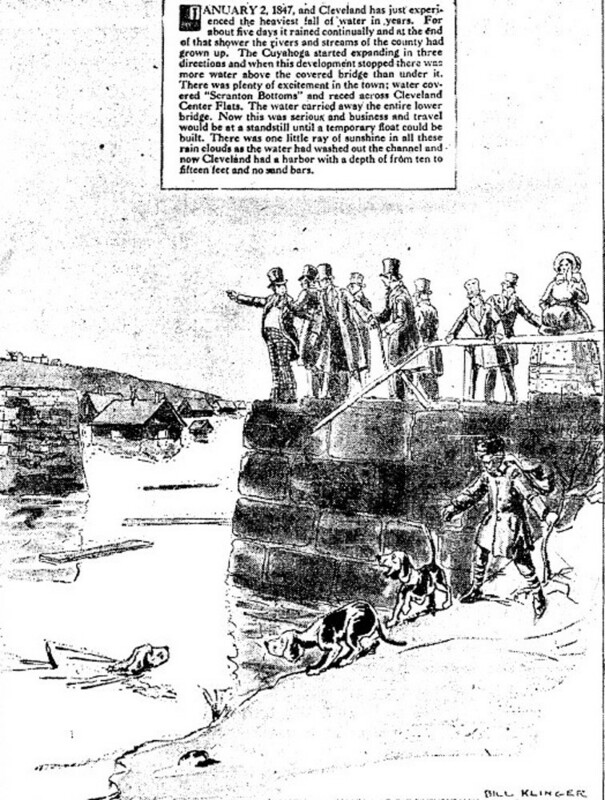 Instead, a national economic crisis—the Panic of 1837—intervened, ending "canal fever" in Cleveland and ruining James S. Clarke. After the economy recovered, it was the Cleveland, Columbus and Cincinnati Railroad (CC&C), rather than international trade merchants, that arrived in Cleveland Centre. 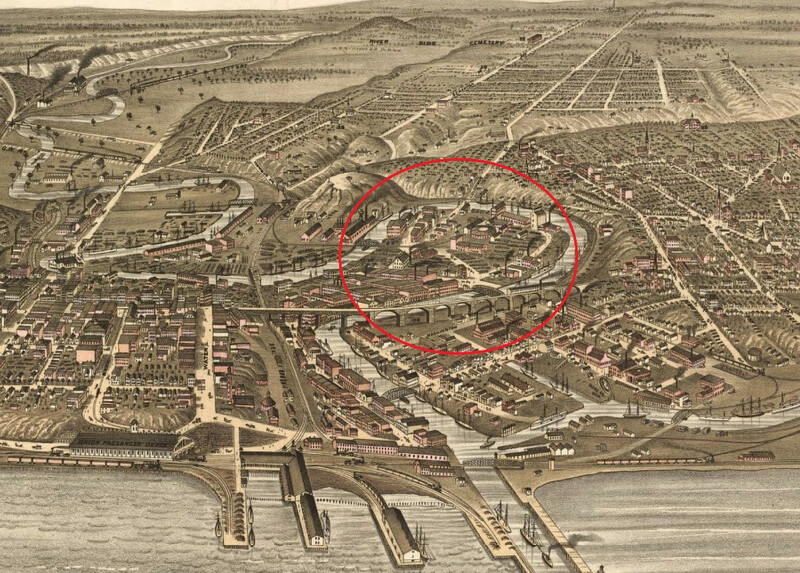 In 1851, the CC&C purchased twelve acres of land on the south end of the Centre—almost one-quarter of the entire development—and there built an engine roundhouse and other maintenance and repair facilities for its trains. 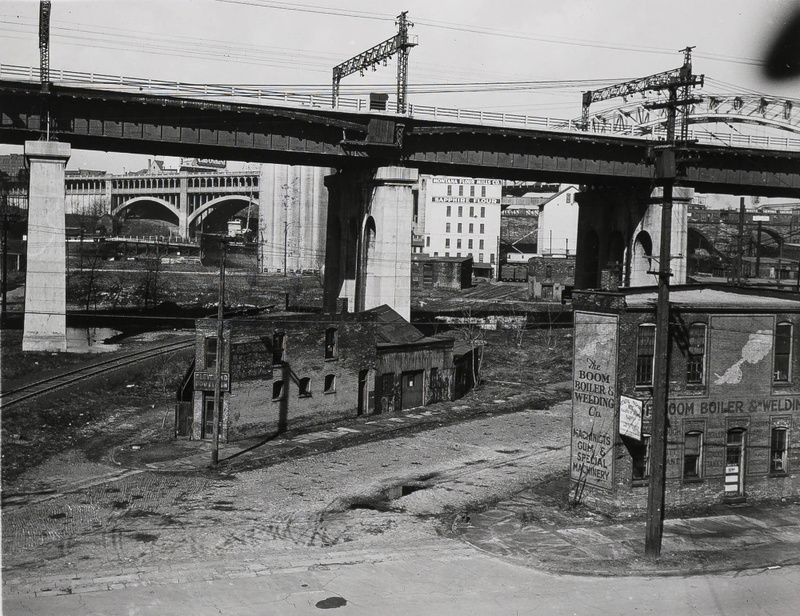 The arrival of railroads here and elsewhere in Cleveland in this era coincided with the city's early industrial development, and in the years that followed a number of industrial buildings went up at Cleveland Centre, on or near the tracks of the railroad. 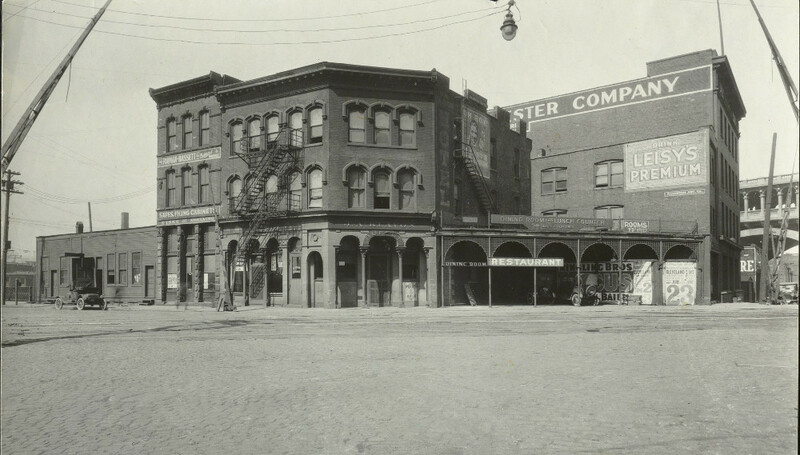 Sometimes, the construction of these buildings required that portions of the streets that radiated from Gravity Place be vacated, and this, over the years, damaged the beauty and symmetry of the original street plan. The residential neighborhood on the east side of the development likewise suffered from the arrival of the railroad and the intensive industrial development. 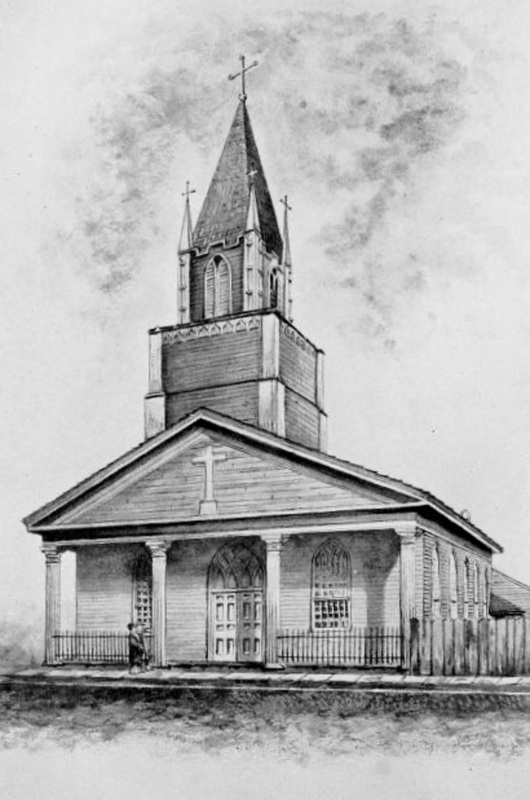 By 1880, St. Mary's had closed its doors and many of its former parishioners had moved out of the Flats. The name "Cleveland Centre" itself lost its cachet sometime in the late nineteenth century as the place became better known as just part of the industrial Flats. When Cleveland experienced de-industrialization in the mid-twentieth century, Cleveland Centre, like the rest of the Flats, languished for several decades as a place of mostly closed factories and empty warehouses. That began to turn around in the decade of the 1970s when the Flats experienced rebirth as a city entertainment district. Cleveland Centre was not, in the early years of this rebirth, home to many of the entertainment venues, which tended to locate to the north, closer to the lake. However, in the early twenty-first century, a number of acres in the southern part of the Centre, formerly owned by the CC&C Railroad and its successors, were re-purposed for recreational use and became home to the Commodore's Club Marina, the Cleveland Rowing Foundation and Cleveland Metroparks' Rivergate Park, which featured a skatepark and a riverside restaurant called Merwin's Wharf. With Cleveland Centre becoming a trendy place once again, Dan Rothenfeld, a local artist, taking it all in and perhaps channeling the ghost of James S. Clarke, proposed in 2016 that historic markers be placed there and that the original radial streets and hub at Gravity Place be lighted so that both on the ground and from the air people could remember and commemorate this early era attempt to build an international trade center in the Flats. And why not? It is not the first time that grand plans have been laid out at this place. Jim Dubelko, “Cleveland Centre,” Cleveland Historical, accessed April 23, 2019, https://clevelandhistorical.org/items/show/767. Published on Sep 12, 2016. Last updated on Apr 18, 2017.